This is a copy of a letter published in The State newspaper, June 4, 2014. The letter is also online at the newspaper. Click for image of the print version. Please cite as: Deflem, Mathieu. 2014. "Activism, Politics Invading USC." Letter to the editor. The State, June 4, 2014, p. A8. 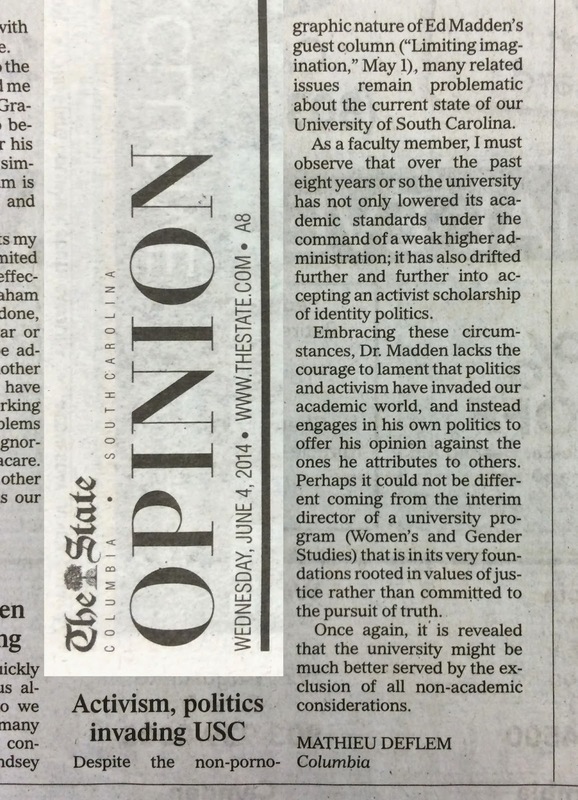 COLUMBIA, SC — Despite the non-pornographic nature of Ed Madden’s guest column (“Limiting imagination,” May 1), many related issues remain problematic about the current state of our University of South Carolina. As a faculty member, I must observe that over the past eight years or so the university has not only lowered its academic standards under the command of a weak higher administration; it has also drifted further and further into accepting an activist scholarship of identity politics. Embracing these circumstances, Dr. Madden lacks the courage to lament that politics and activism have invaded our academic world, and instead engages in his own politics to offer his opinion against the ones he attributes to others. Perhaps it could not be different coming from the interim director of a university program (Women’s and Gender Studies) that is in its very foundations rooted in values of justice rather than committed to the pursuit of truth. Once again, it is revealed that the university might be much better served by the exclusion of all non-academic considerations. See my related writings on university ethics.